Make a statement with one of these exclusive designs. Composed of unique and unusual beads or other materials, they evoke the past, magical places and foreign cultures. 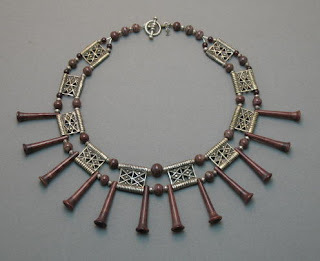 This collar includes cast bits from vintage metal belts worn by the Chin tribal group in Burma, as well as handmade wood pendants, also from the Chin. 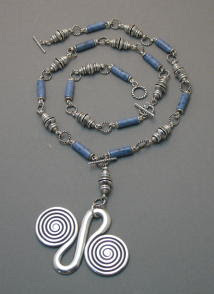 Dumortierite, a stone the color of indigo, complements nicely the fine sterling silver of handmade beads from Bali and the Dong pendant from China. For flexibility, an added bracelet can be worn separately or used to lengthen the necklace. I have been designing for women of confidence and style since 1992 and endeavor to create pieces of modernity with lasting, versatile designs and high quality components. Not costume jewelry, these are treasures that can be enjoyed for a lifetime and handed down. See our page for more designs, or contact me with questions, requests etc. Our beloved King Bhumipol turns 84 today. 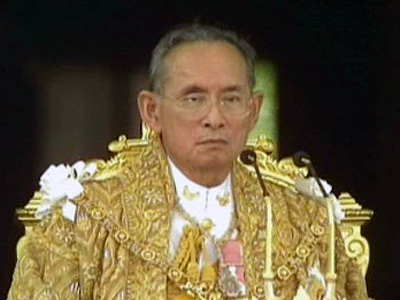 May he continue to share his wisdom for the betterment of his kingdom and its citizens for years to come. Long live the King!